I crave the new. I hunger for the different. I have a taste for change. That is why the concept of tapas is great for me. Lots of little plates keep me entertained. I recently had a magnificent culinary tapas tour in Barcelona and posted many photos on my Facebook page. 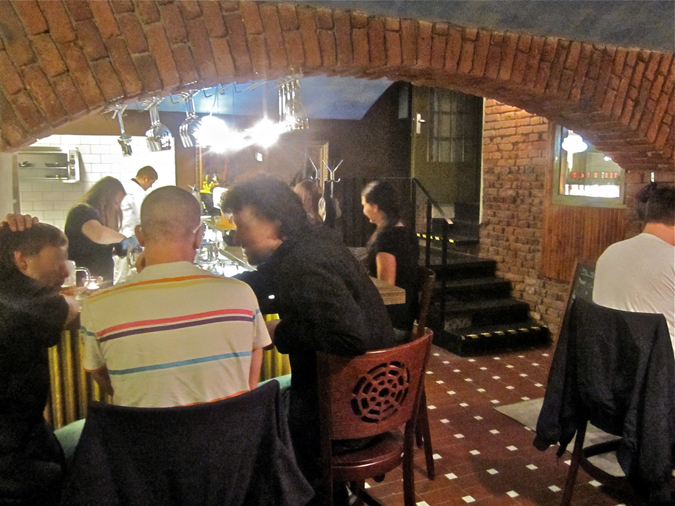 When a friend told me a new “tapas” place opened in Vinohrady, I was eager to check it out. 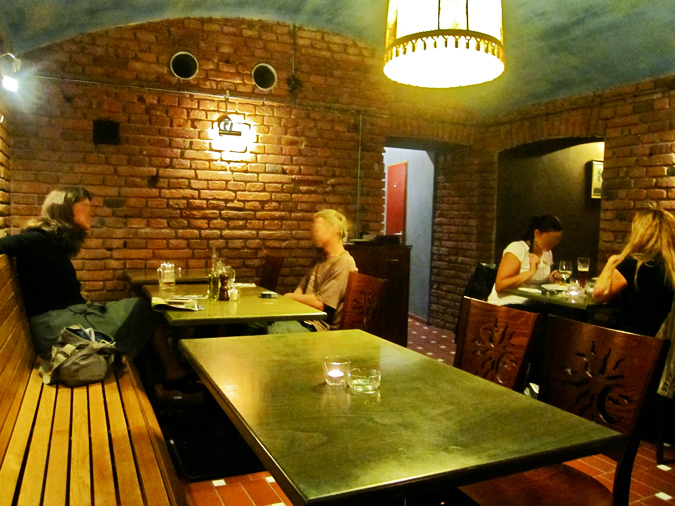 Kofein Restaurant is in a small space below street level near Jiřího z Poděbrad metro station. As soon as I opened the door and looked down, I liked what I saw. Jamón Ibérico sat on the bar and behind that was a cooking station with two chefs. 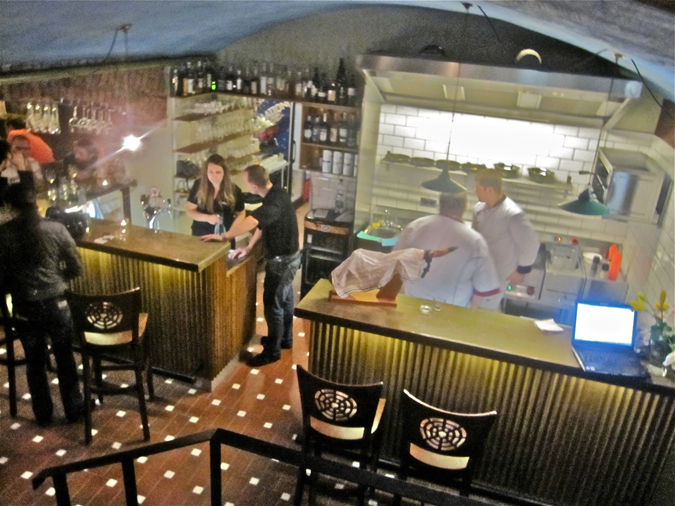 The open kitchen reminded me vaguely of my terrific meal at Tapas 24 in Barcelona. But Kofein is actually more stylish than that top quality but no-frills place, with carved-back chairs, brick walls, and blue ceilings. It’s a small restaurant with just a few places in the front, non-smoking area. There are only about six tables in the back smoking area. While there are a number of Spanish-style tapas dishes on the menu like marinated olives and cheese, the menu does have a broader culinary scope. That’s not to say that the dishes are complex or ambitious. Some are fairly simple. The super-friendly owner, Jara, apologized that the menu was not available in English at the time — they’d only been open a couple of weeks. I told him it wasn’t a problem for me. He helpfully answered some questions. A woman near me was uncomfortable sitting on the wood bench that runs along the wall. Jara improvised a bit and immediately brought a soft blanket over for her to sit on. I started out with a beer. They have Pilsner Urquell, which I like, but I’m bored with. 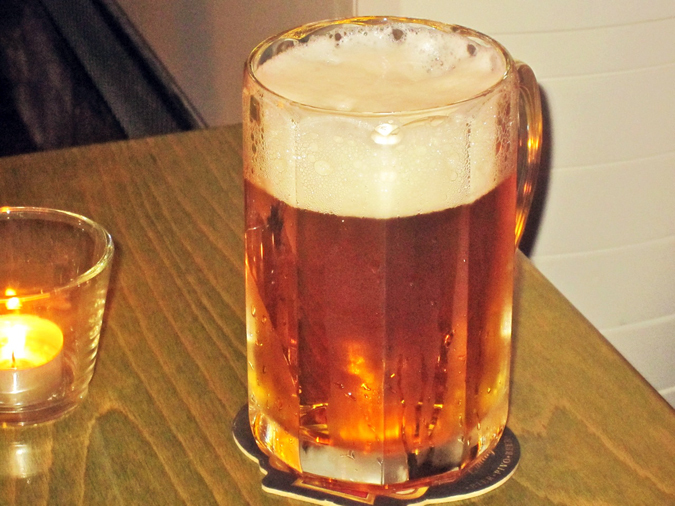 So I got their other beer on tap, Ježek 11 degree lager (28 CZK/half-liter). It was tasty and fresh. 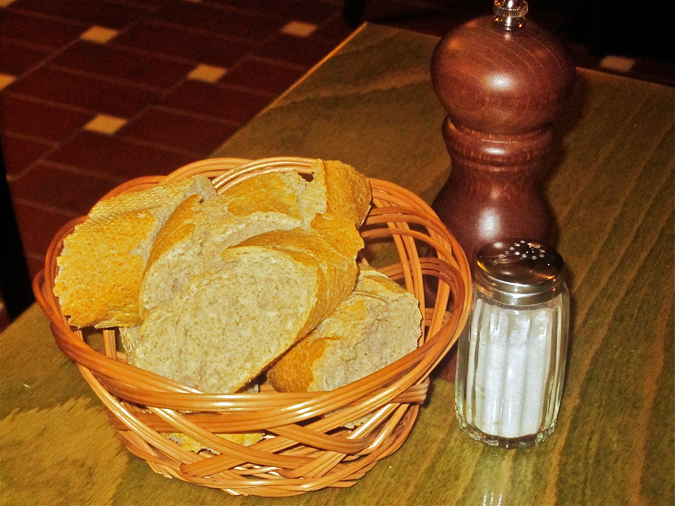 They do charge for a basket of bread (20 CZK). It was an uninspiring basket of whole-wheat baguette slices, not unlike those found at any supermarket. On this solo visit, I ordered five different dishes. Jara was a little concerned it might be too much for one person, but I assured him I could handle it. 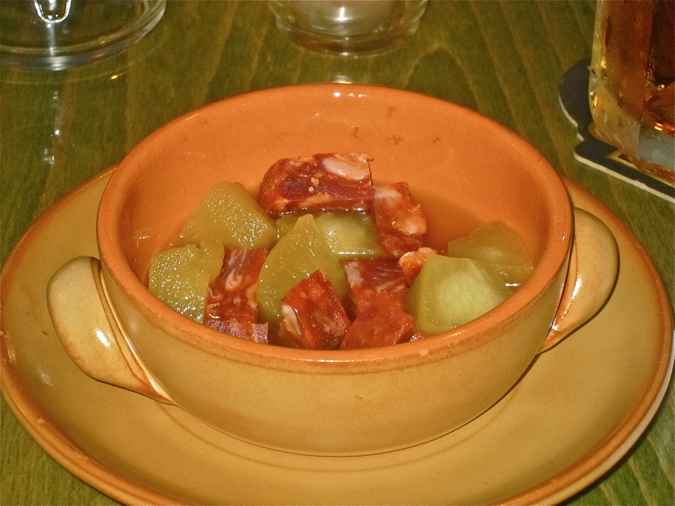 First up, I had the Chorizo Ibérico with apple compote (65 CZK). This was very straightforward with cold chunks of mild red sausage in a bowl with stewed apple slices. I do love sweet and salty combinations and this was pleasant, though nothing to write home about. 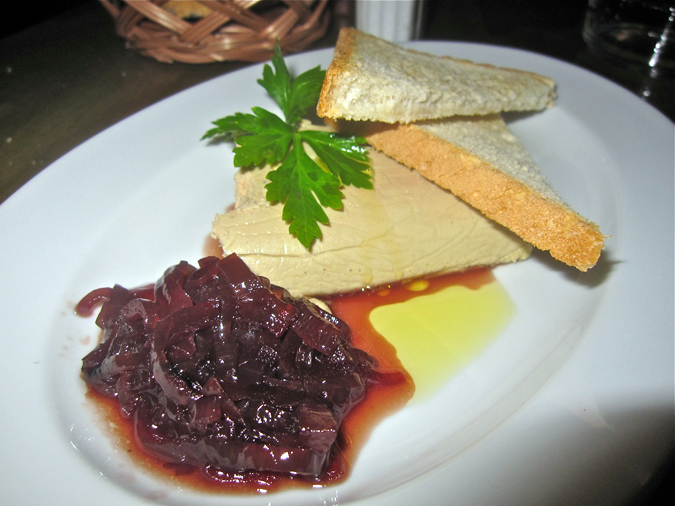 I tried the mild homemade chicken liver pâté with caramelized onions (55 CZK). The chopped liver was very smooth and light, almost duck liver-like. In fact, I really didn’t get the strong chicken flavor found in the more coarsely chopped version at Osteria da Clara. The onions were very sweet. I thought they’d be better with a little tartness in the mix. It came with two small triangles of white toast. 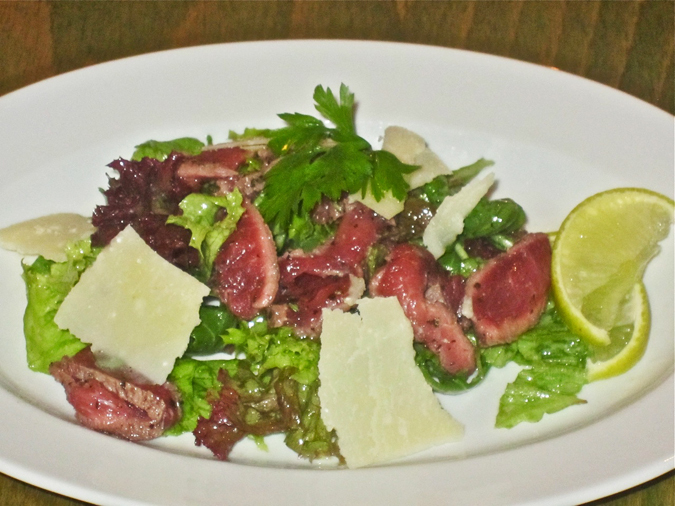 Another cold dish was the seared beef salad with shaved Parmesan (65 CZK). The menu said it came with rucola, but it was really mostly red and green leaf lettuce. It also said the cut was tenderloin, but I found it on the chewy side. I squeezed the lime slices over it and despite these quibbles, I enjoyed it. 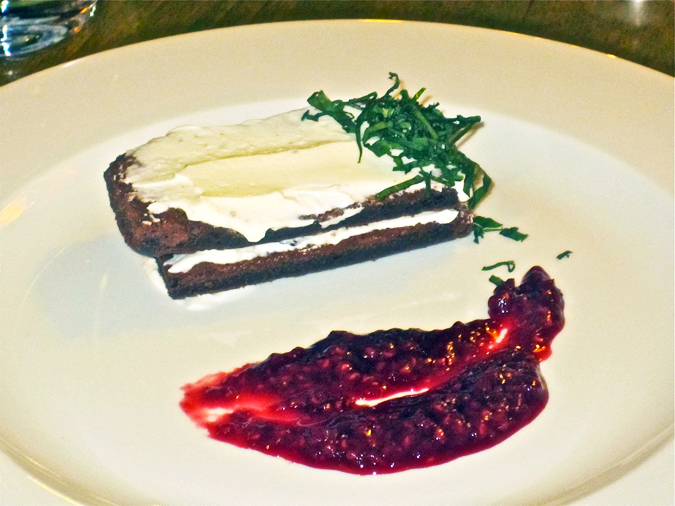 I sampled the baked goat cheese (55 CZK). The two small rounds were heated to the right consistency and topped with a walnut paste. 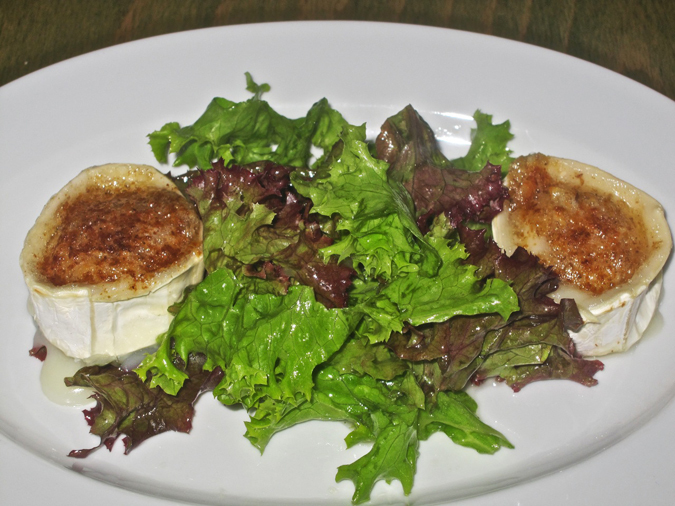 Here the salty flavors and creamy textures mixed well with the honey dressing on the salad. 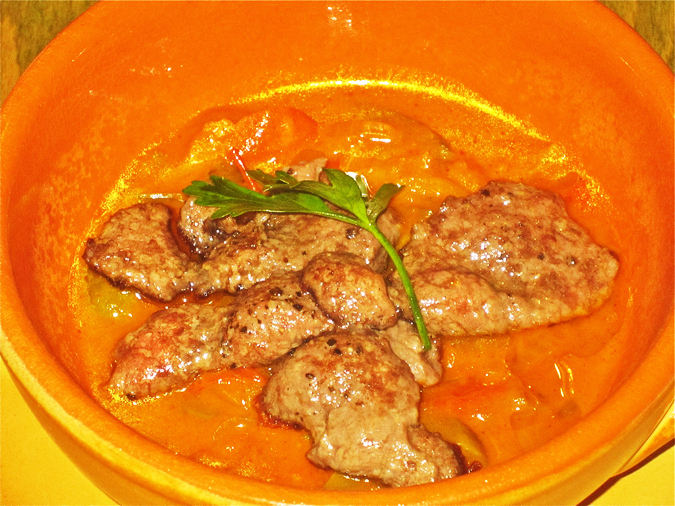 From the warm side of the tapas menu, I tasted the beef tenderloin pieces with spicy vegetables (75 CZK). In this dish, the flavorful beef was much more tender. It was covered with a sauce that had soft red and green peppers. I was disappointed that the sauce was not spicy (pikantní) at all. After these plates, I still had room for dessert. 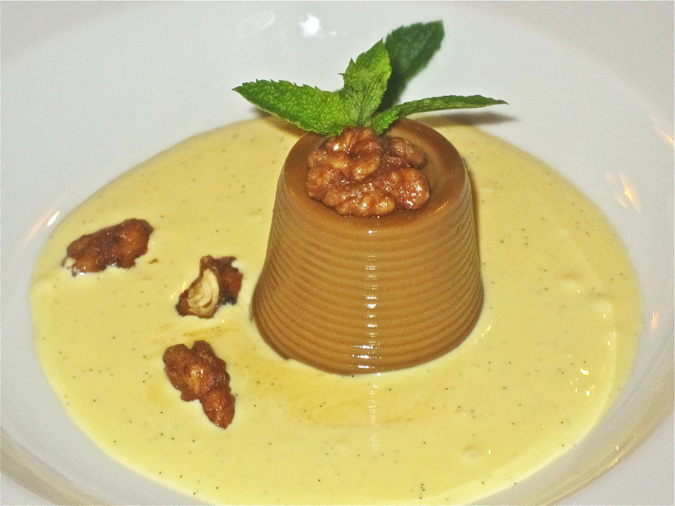 I went for the coffee panna cotta (70 CZK). The dense cylinder was small, but it packed a serious coffee punch. Although a little rubbery in consistency, I loved the intensity. Tiny spoonfuls could hold their own mixed with the excellent vanilla cream. Topping it all was delightful candied walnuts. I loved the dessert. It was definitely the most memorable dish of the dinner. I was stuffed. 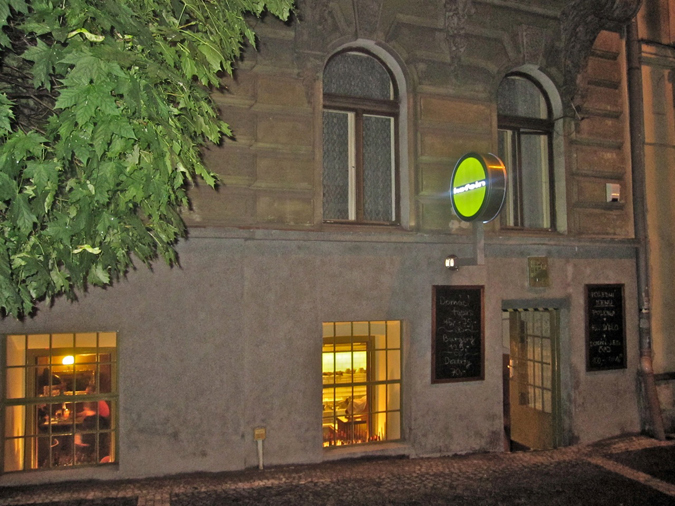 The bill for this large meal of small plates was 461 CZK. On the next visit, I took a friend. 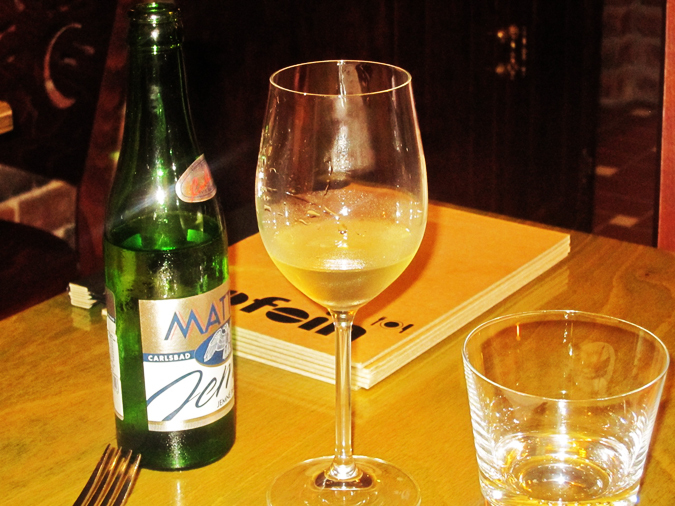 I had Ježek and we also ordered a glass of decent white wine (33 CZK/.1 liter) and a bottle of Mattoni mineral water (33 CZK). 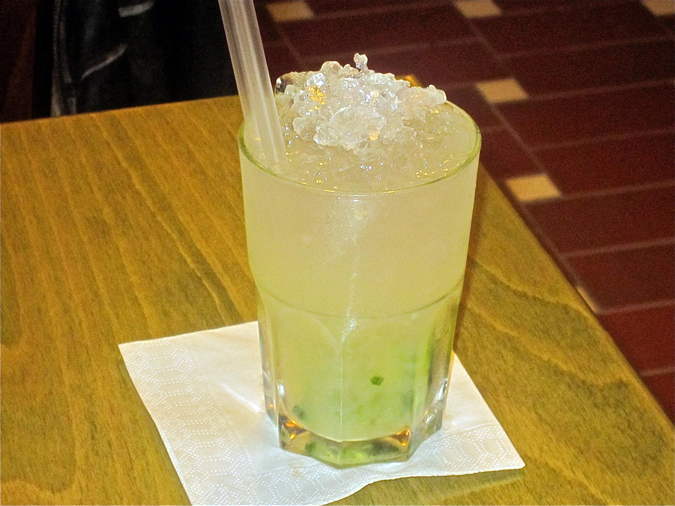 Later, I looked over their limited cocktail list and tried a Mojito (86 CZK). It was not well-mixed, more limey than minty, with a layer of sugar on the bottom. I stirred it up and it was better. 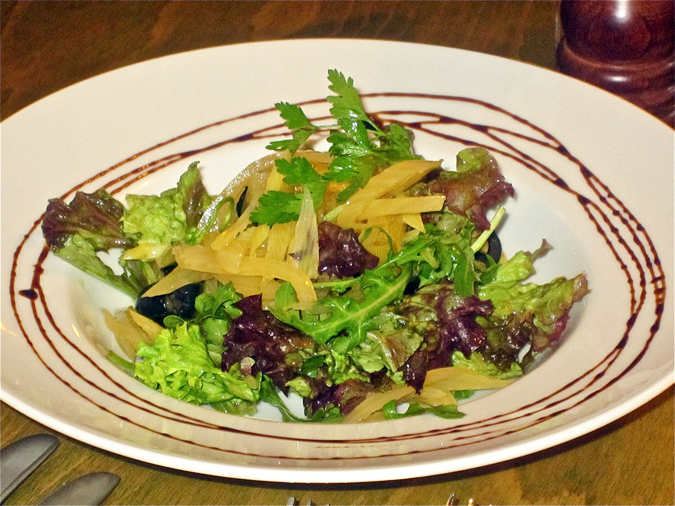 First, we tried the fennel salad (85 CZK). This consisted of red and green lettuce with a few rucola leaves. The fennel was marinated into a seriously sweet state. It was almost candy-like. I can’t say it appealed to me. 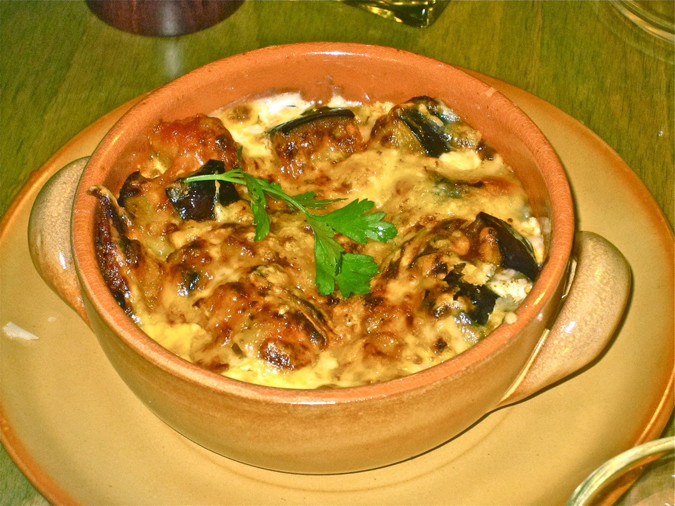 We shared the baked eggplant (65 CZK), which was much like a typical eggplant Parmesan dish. The cheese, which hardened as it cooled, was baked over the top. Underneath were firm eggplant chunks mixed with tomato sauce and a bit of creamy cheese. It was elementary but enjoyable. 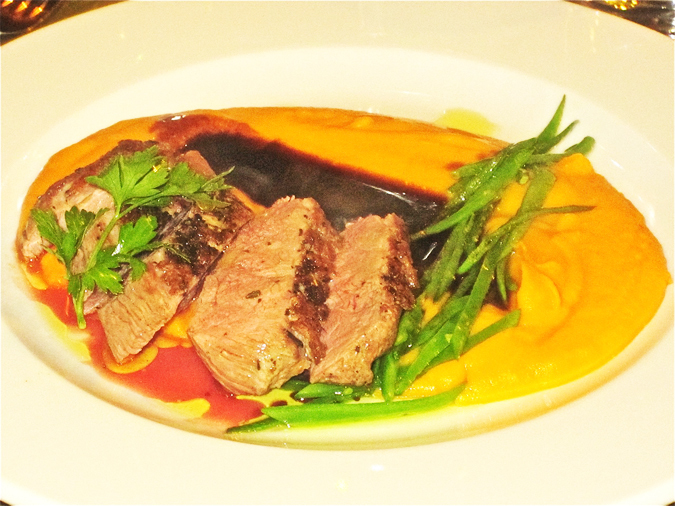 My friend tried the duck breast (255 CZK). It was ordered medium rare, so when it came out at least medium, we mentioned it to Jara. He was very apologetic and offered a glass of wine as compensation, which was accepted. The duck itself was tender and flavorful. It came with a sweet wine reduction sauce that reminded me of Crema di Balsamico. There was creamy but thin purée of sweet potatoes. Although this was from the “Big Specialty” side of the menu, I thought it could have been more substantial for the price. 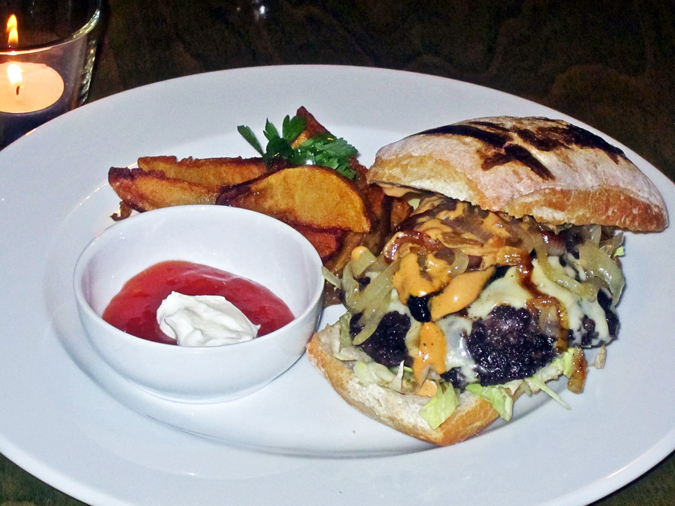 They have burgers on the menu (125 CZK). One is for vegetarians and made with a Portobello mushroom. The other is made with ground beef. That’s what I had. This one is not a conventional, American-style version. One thing that makes it un-American is that it is not excessively large. That’s not necessarily a bad thing, and it is reflected in the bargain price. Another is that it served on a grilled ciabatta. I have made burgers at home on them, so I won’t get pedantic about buns. Under the lid, there are grilled onions, soft bacon, cheese, shredded lettuce, and a tomato-mayo mixture. But the foundation of a good burger is the meat. And I can say this was a particularly good patty of quality ground beef. It had a lovely charred crust and it was still juicy though over-cooked for my taste. On a second visit, they cooked it medium on request. On the side were the best homemade steak fries I’ve had in Prague. Although they were greasy, they had a great crispy crunch that is hard to achieve when preparing and frying them yourself. An Irish friend actually thought they were too crispy. Also on the plate was a dish of sweet red chili sauce with a dollop of mayo in the middle. It was an odd combo, but I didn’t mind the change of pace. I was really looking forward to trying the desserts again. This time, I had the chocolate cake (70 CZK). Sweet cream rested between and on top of two small rectangles of dense, intense chocolate sponge. Minced fresh mint leaves sat on the top corner. On the side was a sweet/sour smear of raspberry with seeds. I liked it all. 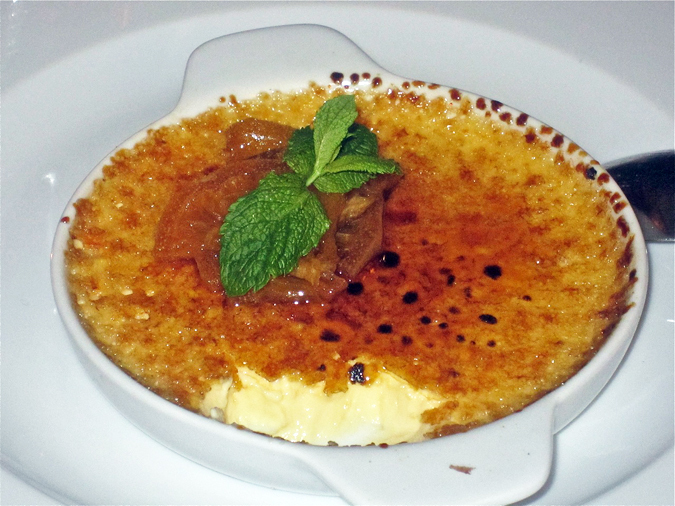 On another visit, I had the Crema Catalana (70 CZK). The not-very-deep dish was filled with orange-infused, slightly eggy cream. It was not as creamy as the crčme brûlée I had at Krystal Mozaika Bistro. It did have a perfect layer of hard, caramelized sugar on top, along with whole slices of candied orange. Overall, I liked this restaurant. With a few exceptions, I can’t say the cooking really soared. Some was just competent and/or basic. Occasional service misfires were easily redeemed by the extremely friendly attitude and smiles. I appreciated the warmth, style and the variety that is on offer at Kofein. You don’t have to spend a fortune to eat some decent and different food. It would definitely be a place I’d meet a friend for a drink and a snack. Or a burger and dessert. Or two. The restaurant deserves credit for bringing something new and different to the neighborhood and putting heart into it. Kofein did not bore me. In fact, I found it quite stimulating. I think you might, too.